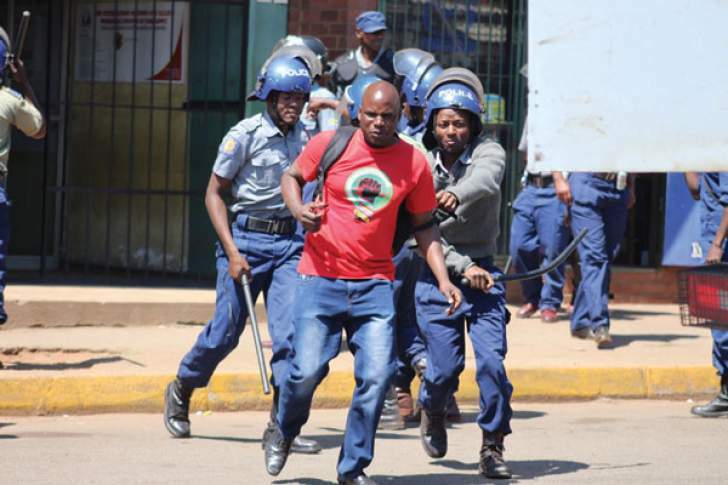 POLICE armed with truncheons, tear smoke canisters and water cannon laid siege on the Zimbabwe Congress of Trade Unions (ZCTU) head office in Harare yesterday and arrested top officials as government brutally clamped down on worker protests against the introduction of a new 2% tax on electronic transfers. Police gangs randomly beat up ZCTU members who were at the offices before arresting president Peter Mutasa and secretary general Japhet Moyo. They also maintained a heavy presence in Harare's CBD to quell any demonstrations, which had been banned on grounds it could trigger a fresh cholera outbreak. Other ZCTU workers locked themselves inside their offices in the second and third floors of Gorlon House fearing police attacks. Zimbabwe Lawyers for Human Rights (ZLHR) member Obey Shava told NewsDay that 26 ZCTU members and workers were allegedly being held hostage at Gorlon House, while others had been arrested. "We are making an urgent chamber application at the High Court to get our clients, who are being held illegally at their offices by over 30 police officers, to be allowed to leave. This attack on civil liberties by the state for whatever reason cannot be condoned," he said. Shava confirmed the arrest of Mutasa and Moyo, but said they were yet to be charged, which he said was a violation of their constitutional rights. MDC leader Nelson Chamisa said the country was sliding back into the era of former President Robert Mugabe which was characterised by brutal repressions of civil liberties and heavy police handedness. "The guilty are afraid, force and terror are short-lived tools of the weak," he said. The development came as a Harare magistrate yesterday dismissed an application filed by ZLHR seeking to overturn the police ban on the ZCTU protests. Magistrate Lazini Ncube upheld the police ban, saying the operation to fight cholera was still going on and the 2% tax protests might turn violent as people were discontented. ZLHR's Noble Chimhanu had submitted that it was unjustifiable selective application and enforcement of the ban of public gatherings which infringed on protesters' right. He noted that the ZRP was expected to hold its funfair tomorrow at the Borrowdale Race Course and at Morris Depot despite the fact that there was a cholera outbreak. In Mutare, 20 labour activists were arrested in the morning while preparing to demonstrate, among them ZCTU regional manager Tenson Muchefa and Zimbabwe Union of Journalists (ZUJ) vice-chairperson Dickson Chaeruka. ZLHR member, Passmore Nyakureba said the activists were expected to appear in court today on charges of illegally gathering with intent to cause public disorder. In Masvingo 12 activists were arrested for defying the police ban. They were bundled up into police vehicles at Benjamin Burombo building which houses government offices as they waited to present a petition to Masvingo Provincial Affairs Minister, Ezra Chadzamira. Their lawyer, Collin Maboke, said they were being charged with contravening section 37 of the Criminal Law Codification and Reform Act. However, in Gweru ZCTU successfully staged the demonstration amid a heavy presence of riot cops and other State security details. The workers marched from Kudzanayi long distance bus terminus chanting slogans against President Emmerson Mnangagwa and Finance minister Mthuli Ncube.